Dr. Don and Roberta Read April 2018 at the West Nile Virus Survivors’ Group. The next best thing to being great, it’s been said, is walking next to someone great. I am grateful to have had the chance to meet and get to know the late Dr. Don R. Read, who passed away on March 21, 2019. He was one of our local colorectal surgeons in Dallas, and a great man in many ways. Dr. Read made his (unfortunate) acquaintance with entomology in 2005 when he was bitten by a mosquito infected with the west Nile virus. He told his story of getting sick, and nearly dying, from the disease many times to the West Nile Virus Survivor’s group he organized and sponsored at the Dallas Medical Center. In reading his obituary I was struck by how a man who led such an active and productive life could be slowed so dramatically by such a little insect. Shortly after receiving his MD, Dr. Don served an externship with doctors in the bush in Zaire (Congo), bringing medical care to remote and primitive villages. As a young man he served as U.S. Navy surgeon in a forward M.A.S.H. unit in Vietnam, for which he received a Bronze Star. Besides bravery, he demonstrated a big heart for people in need. As president of the Dallas County Medical Society he helped organize Project Access to assist and serve the working poor, and was a local pioneer in programs to treat and rehabilitate medical professionals addicted to drugs or alcohol. His life was marked by a remarkable willingness to serve and engage tirelessly with his profession and his community. I learned a lot from Dr. Don about the human side of west Nile virus. For me, he became the face of WNV survivors. He also showed me how it’s possible to turn illness and disability into something positive. He talked about the long recovery for everyone who suffered from the neuro-invasive form of the west Nile virus disease. He excelled at encouraging others to share their stories of illness and recovery. After attending many of his survivor group meetings, the inspiration he and his wife Roberta instilled in other survivors was apparent. Dallas has lost a remarkable man; and I am grateful to have had the chance to know him, even if just a limited acquaintance. In my encounters with him he was always positive and humble, and had a way of making others feel important. The Dallas County Medical Society notes that “Dr. Read’s outstanding dedication to the practice of medicine and the patients of Texas will be honored by the Texas Medical Association as he receives, posthumously, the TMA Distinguished Service Award at the upcoming TEXMED conference in Dallas in May. He received the Charles Max Cole, MD Leadership Award from the Dallas County Medical Society in 2010. The fear of picking up bed bugs in a hotel room shouldn’t keep you from that next great adventure you’ve been planning. Yes, frequent travelers do have a good chance of eventually encountering bed bugs; but a few simple steps can dramatically reduce your risk of bringing these pesky insects home. To learn more, check out this new video, produced by my colleague Dr. Pat Porter, that explains what you can do to avoid the curse of the bed bug. And enjoy that next vacation to New York City! 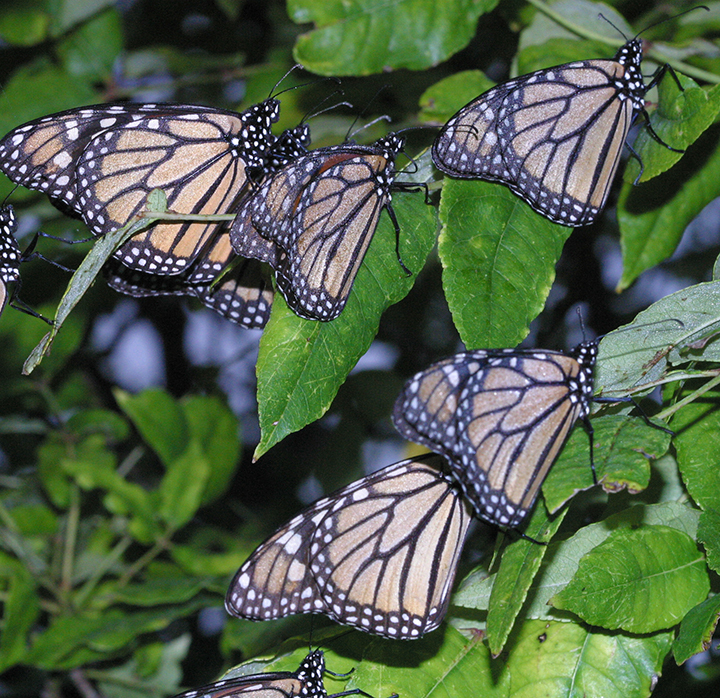 Monarchs resting in a hackberry tree on their way south to Mexico in fall. Where have all the butterflies gone? If you think there are fewer butterflies, and just plain bugs, on your windshield compared to a few years back, you’re probably right. Recent studies point to alarming declines in both insect and butterfly populations. Most scientists think that the primary causes for these declines are the many changes we humans are making to our environment. As we replace plant-diverse rural landscapes with simplified urban and suburban streets and lawns, we reduce habitat abundance and food supply for butterflies, among other insects. One of the hardest hit species is the Monarch, whose 2018 populations are at historical lows and down 14% from last year. The National Wildlife Federation is cooperating with Native Plant Society of Texas to try and slow the decline. The idea behind their most recent project is to persuade more people to devote parts of their home landscapes as butterfly habitat. By providing nectar sources, food plants and safe habitat for migrating Monarchs and other butterflies we help them better adapt to a changing world. This year these folks will be offering a series of Monarch butterfly-oriented workshops around the state. The first class is scheduled for Spring, Tx on January 25th. It’s an intensive, day-long course covering the basics of monarch biology, conservation and habitat creation. Participants will be trained to pass on their knowledge to others in a grassroots effort to drive change in the way Texans shape the environment. If you’re interested and would like to learn more, check out the website and registration page. Consider it payback for the pleasure Monarchs give every spring and fall, and an investment in your grand kids’ enjoyment of nature. Two Good Sams. Sam Hunt (left) and Sam Kieschnick, Texas Parks and WildLife biologist, were responsible for discovering the first emerald ash borer in north-Central Texas. Last summer Texas Parks and Wildlife biologist, Sam Kieschnick, was going through pictures on iNaturalist and saw a picture of an insect taken by someone he knew. It was a shot of a shiny green beetle that 10-year-old nature enthusiast, Sam Hunt, had snapped in his own driveway near Eagle Mountain Lake in west Tarrant County. Something about the picture bothered biologist Sam, so he forwarded it to colleagues who were experts in a group of insects called buprestid beetles. The expert consensus seemed to be that 10-year-old Sam had taken the first picture of an emerald ash borer in the central Texas area. Emerald ash borer is an exotic beetle that has steamrolled its way through the upper Midwest states since its discovery in 2002. As it spread through Michigan, Ohio, Indiana and other states, something became clear. This insect had the potential to be one of the greatest forest disasters ever to hit the U.S. Not only did it kill millions of young and old ash trees, it appears to be poised to completely eradicate wild ash trees from most of the area it has invaded. And now, it appeared, this same ash borer had jumped from Louisiana and a few Texas border counties to the outskirts of Fort Worth, part of one of the largest urban forests in the state. One blurry picture, however, is not enough when it comes to making costly decisions about whether to institute quarantines or alert the public to consider making costly insecticide applications to their trees. An actual sample would be needed. 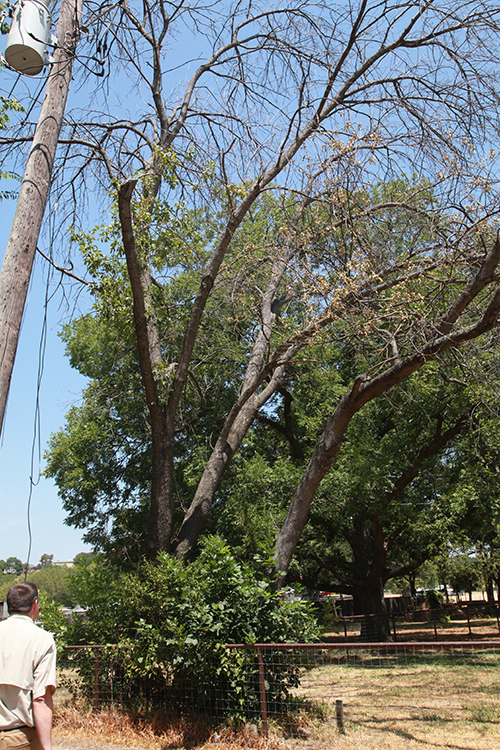 Dying ash tree in a backyard near the first known sighting of emerald ash borer in Tarrant County. Meanwhile, the photo stirred interest among professionals at the Texas A&M Forest Service. Consequently, last summer TFS forester Allen Smith organized two expeditions to the area where 10-year-old Sam had taken his picture. On the second trip he and colleagues were able to collect beetle larvae from under the bark of dead ash trees from the neighborhood. This month those larvae were confirmed, via DNA testing, to be emerald ash borer. How the beetle made its way to Tarrant county is still being investigated, but it’s likely that the beetles found this fall have been in the area for several years. It typically takes around three years to kill mature ash trees, and the infested neighborhood appears to already harbor many dead or dying ash trees. The Texas Department of Agriculture is currently considering steps to declare Tarrant County, and possibly nearby counties, part of an emergency quarantine zone to prevent transport of any suspect firewood or tree trimmings to un-infested areas. This will require the cooperation of wood carvers, firewood distributors, utility and tree care companies, as well as the public. Although there is probably no way to keep the ash borer from eventually spreading throughout the state, efforts to stop accidental human transport will slow the spread of the beetles to your home. Current recommendations developed from experience with the beetle in the Midwest suggest that valuable ash trees within 15 miles of a known ash borer infestation be preemptively treated for the pest. This would mean that many residents of Fort Worth and the nearby city of Weatherford should consider treating any valuable ash trees within the next 2-3 years. Fortunately for us, ash trees make up a relatively small percentage (about 6%) of urban shade trees in the Dallas/Fort Worth area. But if you have a beautiful ash tree in your yard, and it provides good shade, you may want to consider treating it every one to three years to protect it from the emerald ash borer. Monarch adults need a variety of flowers, including lantana, for energy as they fly south for the winter. A single monarch typically travels 50-100 miles a day. In case you haven’t seen your first monarch butterfly of the fall migration, you should start looking now. Mid-October is peak monarch observation month in Texas. So what is fall migration and why all the fuss about monarch butterflies? Monarchs are one of relatively few insects that have true migration. And one of the few migrant animals who instinctively travel thousands of miles to an overwintering site they have never seen before. 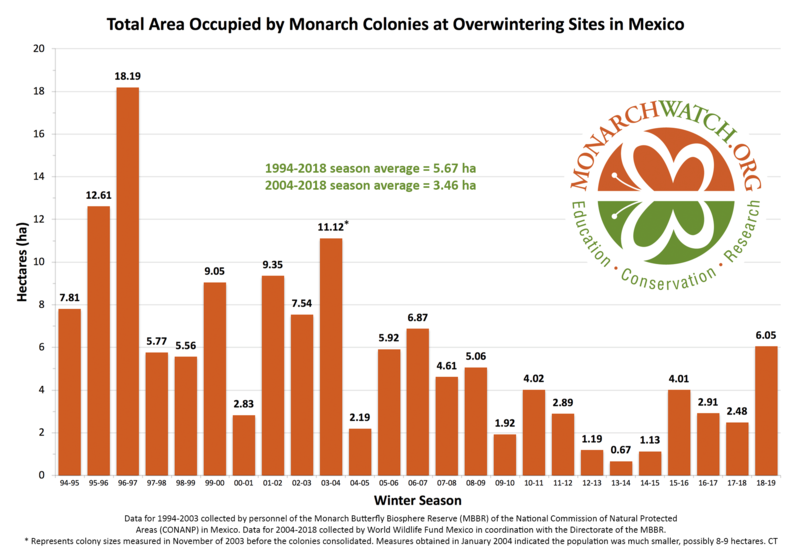 The monarch migration starts each spring with old butterfly adults that have overwintered on a dozen or so mountains in the Mexican states of Mexico and Michoacán, west of the capitol, Mexico City. These mountains provide an ideal overwintering site for resting monarchs. In February each year, these overwintering monarchs leave for the southern U.S. where they will find milkweed plants suitable for their eggs and caterpillars. Here these overwintering monarch adults die, but somehow mysteriously pass on knowledge of the migratory pathways to their offspring. This happens 2-3 more times, all the while they travel further north, until the advent of shorter days and dropping temperatures. These are cues which tell the 4th (or 5th) generation that it’s time to head back to Mexico. This map shows the annual migratory pathways of the eastern population of Monarch butterflies. Green arrows show Generation 1, followed by second (blue) and third (dark blue). Red arrows indicate the two major fall migratory pathways by which monarchs return to their overwintering home in Mexico. The citizen science project Journey North provides real time tracking of the monarch migration each year. To see the progress of this year’s migration, click here. And to see a map of historical Texas data on monarch migration, including when they are likely to be in your area, click here. For more information about the amazing monarch journey, click here to see a great 12 minute video by National Geographic. But don’t just be content with a video. Now’s the time to take a walk and look for monarchs. Chances are that any butterfly you see has already come hundreds of (or even a thousand) miles on its long trip south. Moths, like these fall armyworm moths, have emerged by the millions this week in north Texas. If you live in the Dallas/Fort Worth area, or any other place that has had a recent outbreak of fall armyworm caterpillars, you may have noticed an increase in fast-flying, grey-brown moths. I started noticing these last week, and they appear to be growing in numbers today. If you drive early in the morning, or in the evening, you might even catch these moths in your car headlights. It’s all part of a circle of life: moths lay eggs, which turn into caterpillars, which pupate (think of a cocoon, or chrysalis), then emerge again as moths . This kind of moth outbreak happens commonly enough that Texans, and others around the country, have even given such moths a name. You may hear older citizens and farmers referring to “millers”. Millers, as far as I can tell, is a generic name for any moth that becomes abundant in and around homes. In some areas, millers show up in large numbers in the spring, and in others during the fall. Most people consider them a nuisance, and commonly worry that they are a precursor to some great plague. Scientifically, these insects are called Noctuoid moths, a collection of several families that include armyworms and cutworms. Night-fliers all, miller moths avoid sunlight and head for hiding places in bushes, tall grasses and flowers when daylight arrives. To see if you have been visited by millers, find some bushes or tall grass and do a little brush beating. If present, you will see big gray moths zig-zagging away. Many of the ones I’ve seen appear to be fall armyworms, which I wrote about a couple of weeks ago as being unusually abundant this year. With enough warm weather, it is possible today’s miller moths will turn into another generation of caterpillars; but given the long-term forecast for cooler weather in the next two weeks, I’m guessing this won’t happen. With cooler weather, the armyworm life cycle slows considerably, as does its appetite for crops and grasses. Nevertheless, it won’t hurt to keep a close eye on your vegetable gardens and lawns over the next few weeks. Look for small caterpillars and leaf damage. 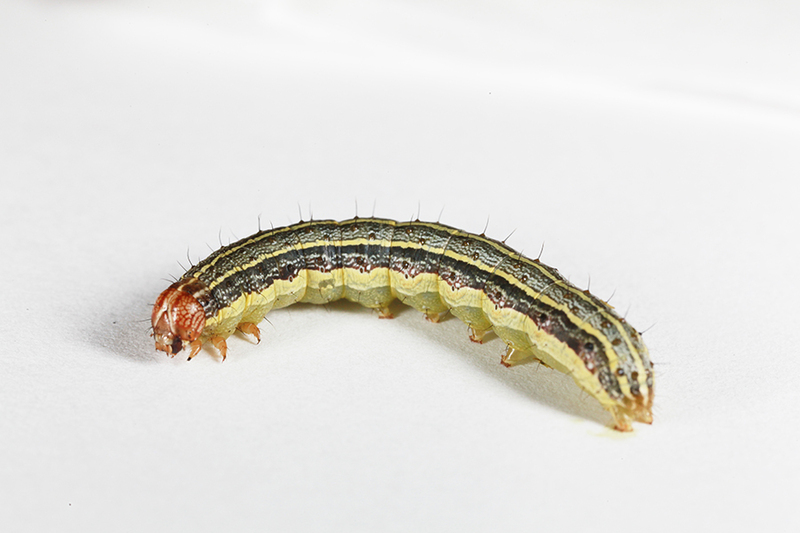 If you do catch early damage, armyworms and cutworms can be treated with B.t. sprays or with the biological insecticide, spinosad. By the way, given the warmer temperature cycle we are in, one of the things we can count on will be more and longer pest seasons. Later frosts mean more time for moths like the millers to reproduce and start a new family. One more reason to wish for cooler weather. YouTube is both a tremendous waste of time and also one of the best things to happen to DIYers in, like,… forever. I find myself checking it constantly for instructions on how to do everything, from troubleshooting my computer to making repairs on my car. So why not a video on how to control crapemyrtle bark scale? What is crapemyrtle bark scale (CMBS)? It’s a small sap-feeding insect that lives on the bark of certain plants, especially crapemyrtle. Thanks to its sugary excrement, it turns crapemyrtles with beautiful honey-colored trunks into black sticks with sticky leaves. It also reduces blooms and weakens some trees. The good news is that we now have some good insecticidal control methods for CMBS and we are seeing more natural control with the help of beneficial insects. Several kinds of lady beetles are helping to keep scale numbers down in many locations. If you have a crapemyrtle tree in your care, and have not yet encountered CMBS, consider yourself lucky. But, for the rest of us, this insect is a pestilence. And if you think you’ll never have the problem, think again. It’s just a matter of time before CMBS will be found throughout the southeastern U.S. If you are seeing CMBS for the first time, it may be new to your area. Consider reporting your backyard or local infestations to the EDDMaps website, which is tracking spread of this pest.